Yes. This is my excuse for a New Years Post. 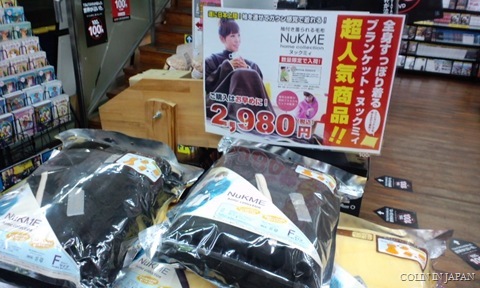 The NukMe, a product who’s name is just as awkward as how you look wearing it, is the recent Japanese solution to the US’s Snuggie. I discovered it the other day at the Japanese alternative to Blockbuster near my house. For all of you not up to date with the Snuggie, here’s a commercial that aired stateside. Modern Japan, Oh, Japan, You! You’ll be thrilled to find out your coming home present–I don’t want to hint, but won’t it keep you warm! One of the most important thing to make real dreaming about 1st position of google is diversity of link sources, and all backlinks of course have to be dofollow. Outstanding post. People always endeavor to utter the evident although it is unnecessary but not you, Fundamental job! You really make it seem so quick with your presentation but I find that topic to be really something that I think I would in no way understand. It seems too complicated and very broad for me. I am looking forward for your next post, I will certainly try to get the hang up of it!